Our Pool — Red Barn Children's Center Inc. The children enjoy swimming and safety instruction and water games in our heated swimming pool, under the supervision of a Red Cross Certified Water Safety Instructor, a Red Cross-trained lifeguard and their classroom teachers who join them in the water to aid in instruction and supervision. Our pool serves as another setting for children to not only learn to swim, but also to continue development in social and emotional areas. Children are encouraged to be kind to others and play with their peers at the same time they are learning to swim. Swim instruction starts with children becoming comfortable in the water and learning the safety rules in and around the pool. Learning to swim offers children the opportunity to experience working towards and eventually achieving their goals. Each child enters the program at different skill levels. We develop an instruction plan that suits each child. During the first week of your child's summer experience, the swim teacher and lifeguard work to observe and asses the skills that the child already possesses and move forward by encouraging other skills that the child seems ready to achieve. We encourage competence of one’s self as opposed to competitiveness. We remind children that everyone learns things at a different pace, and discourage titles such as the “best swimmer”. To help children learn new skills, we find that incorporating games or silly sayings is useful. We sometimes encourage children to be the teacher by helping other children with certain skills. We also focus on success instead of failure by observing and recognizing skills that the child has already mastered. We consider a skill mastered when a child can do something more than once. We make an effort for the pool to be a place conducive to learning at the same time we are having fun. Badges and certificates are given as children achieve certain skills, starting with the Red Barn Safety badge. All children entering the program will earn this badge when they demonstrate pool safety around the pool. f Additional badges are available matching up to Red Cross level 6 criteria. The pool measures 20' x 40' and is 2.5 feet deep in the shallow end and gently transitions to 5.5 feet at its deepest point. 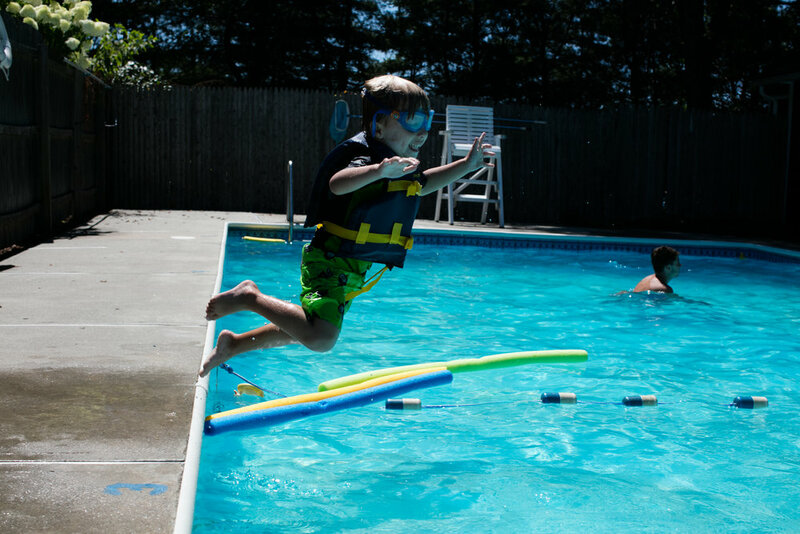 The shallow end is separated from the deep by a floating line and children are not allowed in the deep end until they earn their level 1, aka Duck Badge.